When I tried to replace the light fixtures in my pool I found that there was only about 6 (six) inches of extra wire left in the niche. I attempted to pull on the nub of a wire that was left and I tied a nylon cord at the other end of the light wire so I could use it to fish the new wire back through the conduit. The electrical line broke and after about an hour underwater pulling on that nub of a wire that was left, I was successful in pulling the old wire out. I then attempted to run a fish tape down the conduit at the electrical supply. I could tell that I was almost at the niche in the pool when the fish line would not go any further. It appears as a 90˚ coupling has been installed on the horizontal plastic conduit where it leaves the niche. Then there appears to be a 2nd 90˚ coupling that changes the conduit back to a horizontal run and terminates at the electrical box. Would you have any suggestions on how I can go about running the pool light wire? 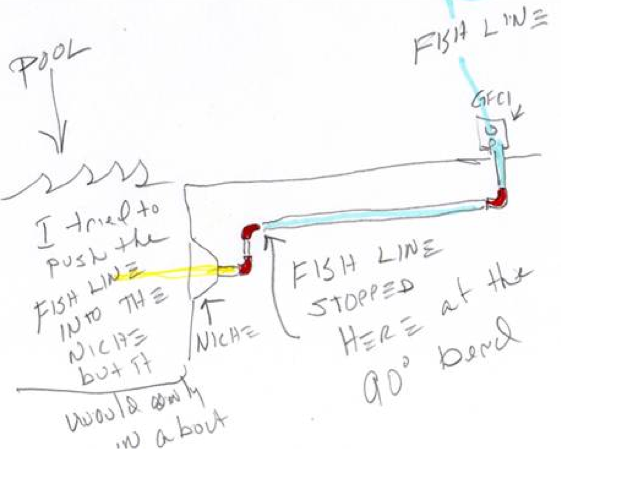 I think that my fish line is too rigid to be able to bend 90 degrees at one coupling and then bend the other way at the second coupling. I would greatly appreciate any advice you might have. I don’t know what else to try to get the wire through the conduit. I have seen that happen many times before in my days as a pool guy (over 17 years ). 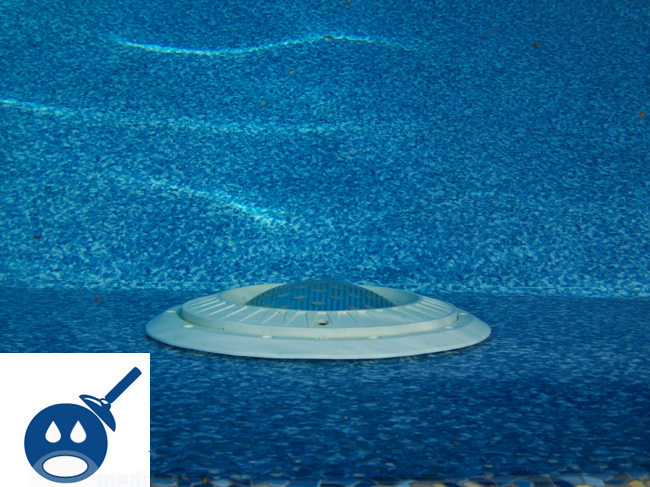 mr. pool Guy, we are trying to replace light in our in ground pool.when we put light back in place it floats around,how do you put it back in? What type and brand of light do you have? Please let me know and I can help you further. This things you can try, but i think your best bet would bea pool guy, he can get u back in tracks for a service call that’d cost u probably no more than 100 bucks. Hello , I have a pool light that I need to replace, light is on deck right now and wire is disconnected, I tried pulling wire out in both directions and it does not want to move,am I missing something to losen up ? “How do I replace the Control Knob Assembly on Hayward CL100 Automatic Clorine Feeder”?